Olivier Giroud's 89th-minute equaliser earned Arsenal a point and denied Jose Mourinho's Manchester United a victory they deserved at Old Trafford. 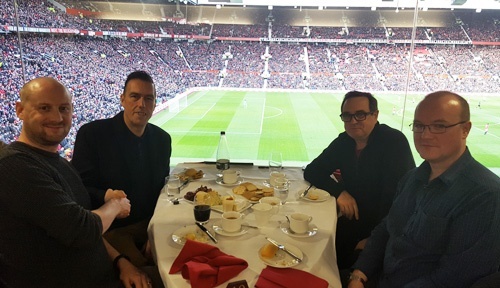 With Crystal Ball securing a corporate membership at Manchester United's Executive Club for the 16/17 season, this provided a unique spectator experience for our highly valued customers at the Manchester Utd v Arsenal game on Saturday afternoon. With champagne and canapes on arrival followed by a 4 course a la carte menu and unlimited beverages, Crystal Ball's Senior Account Manager; Tony Buckley invited customer's Richard Hardy (HATS Group), David Topham (Abbey Flyers Ltd) and Darren Milford (Drive Direct Commercial Logisitics Ltd) to sit back and enjoy the game. 1-1 draw for Manchester Utd and Arsenal. We look forward to inviting and treating more customers at Man Utd with the next home game being Manchester Utd vs Feyenoord, November 24th.